A hernia is the protrusion of an organ through an abnormal opening in the tissue that normally encloses it. The word hernia, in Latin, means rupture. A hernia refers to an opening, or separation, in the muscle, tissue, or membrane that normally holds an organ in place. This opening allows the organ to poke through the hole. Hernias may be caused by muscular weakness, heavy lifting, straining, illness, obesity, or pregnancy. Hernias commonly occur in the groin, where they are called inguinal (ING-gwi-nal) hernias; in the belly button (umbilical hernias); in the chest, where they are called hiatal (hi-AY-tal) hernias; and in the abdomen (abdominal hernias). The wall of the abdomen is made of thick muscle, but holes exist normally in certain places, such as the groin, through which structures such as blood vessels pass. Hernias usually occur when the intestines push out against these built-in weaknesses. Hernias may be dangerous if the protruding piece of intestine gets trapped and twisted, thus obstructing the flow of food and fluid through the intestine, and sometimes stopping blood supply to that part of the intestine. Hernias may develop at different locations in the body, although an individual is unlikely to develop all four kinds of hernia shown here. A hiatal hernia occurs when the stomach pokes above the diaphragm into the chest. An umbilical hernia occurs at the belly button (umbilicus) and is most commonly seen in infants. An inguinal hernia occurs in the groin, where the thigh meets the torso, and happens more often to men than to women. A femoral hernia occurs between the abdomen and the legs, and happens more often to women than to men. whereas others feel severe pain. The only way to fix this type of hernia is to repair it surgically, using stitches or mesh to close up the hole. Without surgery, an inguinal hernia will usually just keep getting bigger over time. 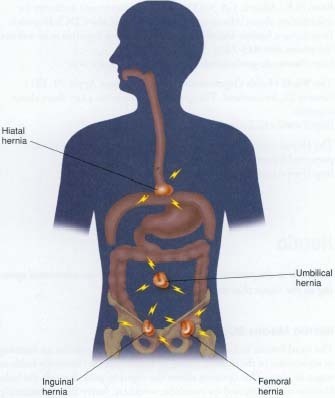 Another common type of hernia is a hiatal hernia. The esophagus, or food pipe, passes to the stomach through a gap in the diaphragm * called the hiatus (hi-AY-tus). A hiatal hernia occurs when the stomach pokes above the diaphragm into the chest. There are no visible bulges, but people have symptoms such as heartburn. Hiatal hernias do not necessarily require surgery. Often, lifestyle changes such as losing weight and avoiding smoking, drinking alcohol, and eating hot, spicy foods can make the symptoms go away. Abdominal, or intra-abdominal, hernias occur more rarely, when an organ in the abdomen pokes through membranes that normally hold it in place. Karen loved taking care of her baby brother. One day when she was changing his diaper, she noticed he had a plum-sized bump along the inside of his thigh where it met his torso (his groin). When he cried, it got bigger, like a small balloon being blown up. It looked pretty strange, but he did not seem to be in any pain. Karen's parents took him to the doctor, who said the baby had an inguinal hernia. The doctor explained that up to 5 percent of healthy babies are born with inguinal hernias, and 80 to 90 percent of children with this type of hernia are boys. These hernias occur because certain openings do not close after birth the way they should, allowing the intestine to bulge out of the hole. The doctor scheduled an operation so that he could surgically repair the baby's hernia, but he assured Karen's parents that the surgery was a safe and common procedure. Babies also sometimes have umbilical hernias, but these usually heal on their own without surgery. The U.S. National Institute of Diabetes and Digestive and Kidney Diseases (NIDDK) posts fact sheets about inguinal hernia and hiatal hernia at its website.